Many Retraction Watch readers will now be familiar with the case of Dipak Das, the resveratrol researcher about whom the University of Connecticut issued a voluminous report yesterday — summary here — detailing 145 counts of data fabrication and falsification. This has been a fast-moving story, so we wanted to highlight a number of updates to our original post, and offer a few more. Antioxidants and Redox Signaling (ARS) is in its 16th consecutive year of publication and has an impact factor of 8.209. Although Dr. Das was listed as Co-Editor, he reviewed only 1 or 2% of the articles and did not have decision-making responsibility on the journal. Yesterday, I advised Dr. Das that he was being dismissed from his position. The integrity of ARS is of the very highest priority to the Publisher and Editor-in-Chief Dr. Chandan Sen, who has been the driving force of the journal since its inception. Dr. Sen’s Editorial concerning this matter will be posted on our website today and in the official journal ASAP. A formal retraction of two articles coauthored by Dr. Das will also be published and uploaded to Medline. Scientific integrity represents the core of the research enterprise and the sharing of scientific information. It is this commitment to intellectual honesty and to responsible conduct and reporting of research that propels the successful advancement of knowledge. This afternoon I received a notification from officials of the University of Connecticut indicating that their investigation on research misconduct has found Antioxidants and Redox Signaling (ARS) Co-editor Professor Dipak K. Das guilty of fabrication and falsification of data. To demonstrate its commitment to protecting the integrity of science, ARS has terminated Dr. Das’s position as Co-editor effective today. The report on findings of the investigation has identified that two articles published in ARS by the Das laboratory suffer from fabricated data.1,2 Both articles have been retracted effective today. Formal retraction notices will be issued on the Publisher’s website (www.liebertonline.com/ars) and published in the Journal imminently. These actions reinforce the high standards necessary to advance the science that underpins the value that ARS brings to its community. Malik G, Gorbounov N, Das S, Gurusamy N, Otani H, Maulik N, Goswami S, Das DK. Ischemic preconditioning triggers nuclear translocation of thioredoxin and its interaction with Ref-1 potentiating a survival signal through the PI-3-kinase-Akt pathway. Antioxid Redox Signal. 2006; 8(11-12):2101-2109. Muinck ED, Nagy N, Tirziu D, Murakami M, Gurusamy N, Goswami SK, Ghatpande S, Engelman RM, Simons M, Das DK. Protection against myocardial ischemia-reperfusion injury by the angiogenic Masterswitch protein PR 39 gene therapy: the roles of HIF1alpha stabilization and FGFR1 signaling. Antioxid Redox Signal. 2007; 9(4):437-445. The 2006 paper has been cited 23 times, according to Thomson Scientific’s Web of Knowledge, while the 2007 paper has been cited just once. The statement — which is reproduced in total at our original post — also claims that Das was “prevented from making a timely response to all of these charges,” although as we noted yesterday, his answer to university investigators has been made public by UConn. Another student researcher who worked in Dr. Das’ laboratory in 2008 discloses that the informant in this case was a trouble maker who chased away many other researchers by intentionally causing friction in Dr. Das’ lab. The former student says the university informant in this case even attempted to “pour wine down her mouth,” hoping to get her to reveal negative things about Dr. Das. The student says she did not witness any scientific irregularities in Dr. Das’ lab during her tenure there, which included Western Blot tests that were alleged to be doctored. It may just fit the classical definition of “irony” that he blames wine, given his area of research. The statement concludes with an attempt to distance Das from Longevinex, a company with which he has worked. It’s a bit convoluted, as the company did in fact fund some of his work, as the statement notes. While the news media made quick association between Dr. Das and a particular brand of resveratrol pill he has tested, Dr. Das has no commercial relationship and does not serve as a paid consultant to any manufacturer of resveratrol pills. He served as an unpaid expert for an online interview of a particular brand of resveratrol, a pill that his laboratory found to be superior to plain resveratrol in laboratory studies. A spokesman for that company, Bill Sardi, managing partner for Resveratrol Partners LLC, dba Longevinex®, says his company has donated product to researchers including Dr. Das’ lab and has underwritten some of the expenses involved in conducting tests, but no researchers have received pay offs or have personally profited from their studies involving his product. Mr. Sardi says his company has not sought to influence the outcome of any independent or sponsored studies. Resveratrol Partners LLC is a private company based in Las Vegas, Nevada. We’ve also found a 2011 issue of the Annals of the New York Academy of Sciences that includes 21 articles on resveratrol and co-edited by Das. You can also read our coverage for Reuters, a story in the New York Times that quotes Adam, and a good blog post by Tom Bartlett at The Chronicle of Higher Education, among other items. We’ll continue to update as we find out more information. “Another student researcher who worked in Dr. Das’ laboratory in 2008 discloses that the informant in this case was a trouble maker who chased away many other researchers by intentionally causing friction in Dr. Das’ lab.”??? The classic approach. Toss the student(s) under the bus. We see this behavior all over science nowadays. It seems highly unlikely that unfounded allegations by some single ‘student researcher’ could sustain an investigation of such magnitude, dismissal proceedings at a major university, and whereby even journal editorial boards are dumping Das in short order and retracting articles effectively on-the-spot. As always, and as I believe someone else mentioned on the other thread for this story, the real tragedy is all the truly competent and promising researchers who didn’t get jobs, grants, published papers, etc., because they were crowded out by this nonsense. In the future, the 1990s and 2000s (and early 2010s) will likely be viewed as the equivalent of the ‘steroid era’ in major league baseball. Hard to know what/who to trust. This is also a good lesson for the private sector: stop giving all your money and support to the hucksters!! Word up, good science is damn hard work, and takes time and causes headaches. Right you are, whatever your identity is. But I would really wait to see the fate of Dr. Maulik. I think once an investigatin is intiated (of course we always say that one is not guilty until it is proven), the community should be very careful about them. My identity is already given with my name. I’m glad that Sierra Rayne actually uses his real name. There’s so often comments left on these articles with members who use pseudonyms rather than leaving their real names. Not that it’s not their right to remain anonymous, but I always skip over the comments (ok, not all, but most) that have fake handles. Interesting Diptarka. I found at least 15 papers of Prof Das with a one called Diptarka Ray. By any chance, you have worked with Prof Das..just curious to know..I don’t understand the need to see the fate of Dr. Maulik. Indeed, Diptarka, Ressci Integrity is correct. I assume you are the real Diptarka Ray from Das’ group? Can you shed any insights on the issues at hand at UConn? According to this page, you completed a B.Sc. (Hons.) in Botany at Scottish Church College between 2001-2004, but then also list a M.Sc. in “Plant Science andd herbs (Ecology Special)” [sic] from the University of Calcutta between 2001-2006. You started your M.Sc. at the same time you started a B.Sc.? Damodaran Chendil and the inquiries made to several journal editors. Did anyone respond? Yes, at least one journal editor replied re: Chendil and said they were looking into the matter (I posted the editor’s reply back on the Chendil discussion page when I received it). No other responses whatsoever from the other editors. I agree completely, Sierra. So many examples of a student taking the fall when the professors get caught neglecting their obligations. So many examples of scientists who have high standards being called troublemakers for pointing out defects. So many instances of money being thrown in the direction of a huckster instead of directed toward valid but less flashy research. And yes, it is unlikely that the investigating committee could have found so many problems with the data if this were only a case of a disgruntled student making false accusations. Love your suggestion that this is science’s ‘steroid era’. Cheer for this sentence: “Good Science is damn hard work, and takes time and causes headaches”. In my study, to find the project costs around 2 years and then after working on it for another 2 years, I published my first first-author paper. I believe it is a wonderful discovery, however, I didn’t get enough finacial support in my study. Life was very hard during that time, not just causing headaches. Seems the editors of the blog now have to declare a conflict of interest as they are actually journalists providing articles to Reuters etc…. “a labor of love” as they wrote in previous posts ?? Perhaps you missed our “about” pages, available on the upper right-hand corner of our homepage. We are both working journalists, as we have made clear from day one, and my day job is as executive editor of Reuters Health, which is stated clearly there. There are no ‘conflicts of interest’ regarding the truth. Who cares who someone works with or for or why? We see these types of red herrings all over the place nowadays. In science and science journalism, we need to stick to the objective issues and assess the merits of a case on its facts. Don’t you mean “rebutting” rather than “refuting”? He meant “rebutted” but he claimed “refuted.” Another example of attorney-speak. PS Isn’t a whistleblower a troublemaker by definition? Shouldn’t be derogatory unless the “trouble” is undeserved. Dr. Seitz, love the icon. Is that a see-no-evil monkey? As a person who has been punished for being a troublemaker, I would protest that I didn’t make the trouble, I merely reported it. The person who made the trouble is the one who should be punished, not me. And I agree with you that there should be nothing derogatory in whatever label is attached to those who report, unless the reports are false. Unfortunately, administrators would rather shoot the messenger than admit that wrongdoing has occurred on their watch because of their lax attention to basic duties, or even because of their negative example. I do love that icon. Reminds me of several administrators I know. sorry.. B.Sc was from 2001-2004 and then the master from 2004-2006. And yeas, I am the one. Maulik was the one in Das group and was heavily involved but somehow not in accusation list! This seems to imply some type of group knowledge/agreement in the Das group regarding problematic activities, rather than just the PI acting alone and/or some ‘rogue’ students/post-docs? Would you please contact me. I am still at the same e-mail that we have communicated in the past. Wasn’t there a mention in the summary that additional people from the lab were under investigation by some other integrity board at the university? As the scope of the fraud became clear, the committee was told to restrict its investigation to Das, but names turned over by the Das committee will be looked at. And I believe there was even a hint that the Das committee continued to turn up names even as they were trying to wind up their work, so maybe there will be yet more to the story. good that you have moved away…but be careful in implicating people….i guess publications themselves will tell who are involved and who are at the periphery. Be vigilant.. Does anyone have a copy of the final narrative.pdf file? I teach a course in ethics and wanted to look at this and maybe show it to my students. The UCONN link for the file has gone dead. I worked down the hall from this lab until may 2009. I had no idea! 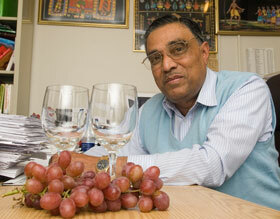 Next Next post: So how peripheral was Dipak Das’ resveratrol work, really?